The European Union, United Nations, more than half the US states, and several European countries have adopted versions of the Swedish Vision Zero road safety approach. Vision Zero is a government policy, adopted in 1997, which, according to the Swedish Transport Administration, “turned the traditional view of road safety work upside down”. Instead of focussing on accident prevention in general, Vision Zero “puts people first” and focuses in particular on counteracting accidents that can lead to fatalities or lifelong injuries. Municipalities, companies, organisations and authorities collaborate to reach this ambitious — and some say, unattainable and unreasonably costly — goal. Statistics do show that Sweden has come some way towards achieving its ambitions and that Swedish roads are among the safest in Europe. Since year 2000, the number of traffic fatalities has halved in Sweden. A decade ago, in 2008, a total 440 people died in traffic accidents. That figure is now down to 254, with around 4,000 people severely injured in 2017. The Swedish Transport Administration’s goal for year 2020 is to bring down the number of road-traffic fatalities to a maximum of 220. Maria Krafft, head of traffic safety at the Swedish Transport Administration, said the key to Vision Zero’s success is that it involves treating the traffic network as “a complete system”, as a system that should be designed so as to minimise the harm of potential human errors. “For instance, if you need to have an intersection on a road where the speed limit is 80 kilmotres per hour, then you design the road in a way that ensures you bring down the speed of cars successively so as to prevent fatal accidents at that intersection. You may add a roundabout ahead of it, for instance,” said Krafft. A crash at a lower speed will still involve damages, but there is a reduced likelihood of those involved in the accident dying or sustaining lifelong injuries. The idea is that safety aspects should be built into the traffic system and included when planning, designing and building infrastructure projects. In practice, the Vision Zero policy has involved measures like separating car lanes with physical barriers and building so-called two-plus-one roads, which consist of a two-lane section in one direction and one-lane section in the other, allowing for safe overtaking. Other measures focus on changing the behaviour of drivers, for instance ensuring that people stick to speed limits by — in addition to putting up speed-limit signs and installing speed cameras — building narrower roads and wider sidewalks in cities so that drivers are forced to keep a steady pace in busy areas. Automatic alcohol tests are another example, as well as encouraging car manufacturers to build safer vehicles with built-in features like loud signals that are only switched off when passengers buckle up. 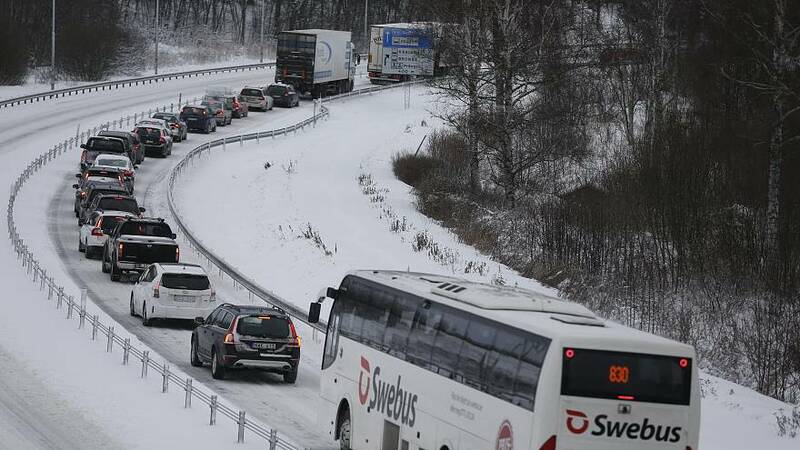 Sweden’s downward trend in traffic fatalities over the past two decades can also be observed in the other Nordic countries and in the European Union, which aspires to halve the figures between 2010 and 2020. Sweden also has one of the world’s lowest number of traffic fatalities per capita. According to a report from April 2017, figures in Sweden are on par with the UK and the Netherlands, with only Norway and Malta registering fewer deadly accidents. In 2015, there were 2.7 deaths per 100,000 residents in Sweden. The figure remained the same in 2016. According to Krafft, what is unique about Sweden’s approach to road safety is that authorities do not focus on calculating the societal costs of accidents. Instead, there is an “ethical imperative” behind Vision Zero where authorities should take responsibility for “making it easy to act correctly in traffic and mistakes should not be punishable by death,” as the Transport Administration’s website puts it, drawing a parallel to how it is taken for granted that no deaths or lifelong injuries should occur as consequences of work-place accidents. The same goes for the roads, in the Administration’s view. Marking the 20th anniversary of Vision Zero in September 2017, the government announced a renewal of the policy, vowing to create safer systems and to focus on reducing drunk driving and speeding, and on protecting pedestrians, cyclists and motorcyclists. Digitalisation and automation also offer new possibilities for increasing traffic safety, said Krafft, who brought up geo-fencing as an example. A geo-fence is a virtual perimeter that can be used to, for instance, restrict a geographically defined area only to authorised vehicles. It could also be used to limit vehicles’ speeds to the highest permitted in a given area.